BEVERLY HILLS, California, Dec. 1, 2013 /PRNewswire/ -- As movie fans await the imminent release of the second film of The Hobbit Trilogy - and another epic dose of Middle-earth landscapes - New Zealand has taken a cue from Hollywood by unveiling a giant pop-up book of New Zealand in Los Angeles. The country that provided the epic scenery that backdrops The Hobbit Trilogy movies has installed the world's largest pop-up book - occupying an area roughly the size of two tennis courts and 50 feet high - in the grounds of the Beverly Hilton hotel, that shows how film fantasy becomes reality for visitors to New Zealand. The pop-up book of New Zealand is on site for five days coinciding with the Hollywood world premiere of The Hobbit : The Desolation of Smaug - produced and directed by acclaimed Kiwi film-maker Sir Peter Jackson. It is divided into four sets representing new filming locations from the film - Hidden Bay (Turoa, Ohakune), Forest River (Pelorus River, Marlborough) Lake-town (Lake Pukaki, Mt Cook), and Beorn's House (Paradise, Queenstown). With original pieces of the actual movie sets and living features of the real landscapes, the pop-up book employs multi-media production techniques and film-making wizardry to show how the film fantasy is firmly attached to the real life Middle-earth landscapes of New Zealand. Guests will literally step into the giant book and take a unique journey through four of the principal filming locations for the Trilogy, combining the actuality of the book, and the magic of the movies with the reality of the Middle-earth locations. Authentic props used for the pop-up book of New Zealand include the giant wooden armchair from Beorn's house, two-level waterside houses and a boat from Lake-town and the gigantic brooding bust of the dwarf king Thror that stood over the back entrance to Lonely Mountain. It will set the stage for media activity and cast interviews with The Hobbit Trilogy stars for the media junket based around the LA premiere of The Hobbit: The Desolation of Smaug on Monday and provide an innovative setting for New Zealand hospitality and film business events. Access to the pop-up book of New Zealand will be reserved for a series of invitation-only events, but a select group of lucky film fans will have the chance to browse the pages as part of a special public tour this Wednesday. Jackson's epic Tolkien-inspired productions of the Lord of the Rings and The Hobbit Trilogies have created a legendary fan following and been at the source, over the past decade, of a film tourism phenomenon for his home country New Zealand. The much anticipated The Hobbit: The Desolation of Smaug, a production of New Line Cinema and Metro-Goldwyn-Mayer Pictures, is scheduled for worldwide release on 13 December, 2013. New Line Cinema and Metro-Goldwyn-Mayer Pictures Present a WingNut Films Production, The Hobbit: The Desolation of Smaug. The film is a production of New Line Cinema and Metro-Goldwyn-Mayer Pictures (MGM), with New Line managing production. Warner Bros. Pictures is handling worldwide theatrical distribution, with select international territories as well as all international television distribution being handled by MGM. NEW YORK, Nov. 30, 2013 /PRNewswire-USNewswire/ -- World-renowned tenor Anthony Kearns will be a featured guest artist on the Fox News Network's popular show, 'Huckabee,' this Saturday, November 30, at 8 p.m. ET and again on Sunday, December 1, 2013 at 8 p.m. and 11 p.m. ET. This will be Mr. Kearns' third major appearance on the highly-acclaimed television show. Former Arkansas Governor Mike Huckabee, host of the weekend show, said: "I'm pleased to welcome Anthony Kearns back to my show to kick off the Christmas season and update me on his projects -- including the release of his new solo album. We love having him -- he's a remarkable talent." Following Kearns' first appearance on the show, Governor Huckabee said that Anthony's performance "generated among the best feedback that I've seen about one of our musical guests." Mr. Kearns made millions of new fans during his debut performance on 'Huckabee' in 2010 with his delivery of "The Lord's Prayer" and "Danny Boy." He performed again on the show in 2011 with a stunning rendition of "Ave Maria" which he dedicated to U.S. military troops. "It's a particular honor and privilege for me to return to the Governor' television show to help him launch the Christmas season. Christmas has great meaning for me personally -- and I appreciate the opportunity to bring some holiday cheer to his national audience," said Kearns, who will be performing with his long-time accompanist, Patrick Healy. "Beautiful music of all genres is one of Governor Huckabee's greatest passions -- and we're grateful to him for having Anthony back on the show. He will sing 'Hark! The Herald Angels Sing,' from the best-selling album Christmas by The Irish Tenors," said Mr. Kearns' publicist, Kirsten Fedewa. "Hark! The Herald Angels Sing" is a traditional Christmas hymn taken from the Gospel of St. Luke when he described the Angels announcing the Birth of Jesus to the shepherds near Bethlehem. On Thanksgiving, Mr. Kearns sang "We Three Kings," the title track of his hugely successful holiday album with The Irish Tenors, as a headliner in the 94(th) Annual Thanksgiving Day Parade -- the oldest of its kind in the nation -- in Philadelphia, PA. The show attracted up to one million parade-goers and an estimated televised audience of approximately 12 million on ABC affiliates. Earlier this week, Kearns was a guest of the radio show, The Mike Huckabee Show, to discuss his performance in the Thanksgiving Day Parade and other projects including the release of his new solo album, "With a Song in My Heart." Listen here: http://bit.ly/1aZn0o1. Kearns, a founding member of The Irish Tenors, also discussed his 16-city Christmas tour which began last night in Greenville, South Carolina, to rave reviews. Together, the trio has 10 best-selling CDs and five PBS Specials. See tour dates at: http://www.theirishtenorsmusic.com/tour-dates.html. Mr. Kearns' celebrity appearances, including his appearance on 'Huckabee,' are arranged by Kirsten Fedewa & Associates, L.L.C. Chicago Bears' Devin Hester Wins Unprecedented 1-1 Race With Cheetah! WASHINGTON, Nov. 30, 2013 /PRNewswire/ -- Captured on tape for the first time, NFL player for the Chicago Bears Devin Hester -- the super-agile wide receiver and kick returner -- outruns a cheetah in the one-on-one race at Busch Gardens Tampa's Cheetah Run attraction. Additionally, Tennessee Titans' Chris Johnson -- the NFL's fastest running back -- also gives the cheetah a run for its money. The races are part of Nat Geo WILD's Man v. Cheetah, which kicked off the network's fourth annual BIG CAT WEEK Friday night. The race can be seen again in a special encore Monday night, Dec. 2, at 8 p.m. ET/PT. For more information on BIG CAT WEEK, visit www.natgeowild.com/bigcatweek or follow us on Twitter @NGC_PR. To prepare the cheetahs for the race, Busch Gardens Tampa trainers used training techniques to help familiarize the cats with new experiences, such as running next to a trainer separated by an 11-foot wall and placing cameras high above the habitat. A month before race day, the trainers began working with the cheetahs conducting sprints using the same motorized lure system they were already using to stimulate the cats' natural instinct to chase. Take nature's fastest land mammal vs. two of the quickest and most elusive athletes in all of professional sports -- who wins ... and what shocking secrets are revealed? Nat Geo WILD gets a front row seat as the Tennessee Titans' Chris Johnson -- the NFL's fastest running back -- and the Chicago Bears' Devin Hester --the super-agile wide receiver and kick returner --take part in an extraordinary first-ever one-on-one challenge against a cheetah. It's the race of a lifetime that has never been attempted before as cheetahs from Busch Gardens Tampa's Cheetah Run attraction race NFL's finest. America Teve Gave Thanks to their Viewers in South Florida with a Massive Turkey Give-Away! 1000 viewers arrived at the studios of America Teve in Hialeah Gardens to pick up their turkey for their Thanksgiving dinner. MIAMI, Nov. 29, 2013 /PRNewswire/ -- America Teve's employees and families, Maribel Santa Cruz M.D., Luis Castro from Univista Insurance, Florencia Contesse from FPL, Sonia Amador from Miami Bankruptcy Center, Neil Gonzalez from Law Offices of Gonzalez & Associates, Hialeah Park & Casino, Jesus Diaz from Furniture Wholesale Warehouse, Luis Diaz from Car Factory Outlet and Ayon Rey from Mengar Auto Finance celebrated the season with the viewers by giving away 1000 turkeys to the community. The give-away was conducted by Mr. Omay Romay - President and CEO of America CV Network -, the generous sponsors, and a big list of talent and reporters: Omar Moynelo, Maria Laria, Juan de Alba, Ari Pinelli, Kary Bernal, Yossie Galindo, Alejandra Molina, Yelenis Reina, Carlucho and their dancers, Pedro Sevcec, Nadia Rowinsky, Luisiana Rios, Juan Manuel Cao, Felix Guillermo and Carlos Otero, among others. Starting at 8:00 a.m., America Teve's viewers began to get in line outside of the studios. "This is the moment to give thanks to our loyal audience. They support us day after day and they choose us over all other stations," declared Mr. Omar Romay as he gave away a turkey to a viewer that rode in his motorcycle. The Hialeah Gardens' police assisted in guiding the heavy traffic that the activity generated. It was a wonderful gift exchange. Most families that were recipients of a turkey also gave us back their joy, good feelings and holiday cheer. Happy memories of gratitude will linger at our station and in our hearts all year long. About America TeVe: America TeVe is an independent Spanish language television station based in Miami, FL and owned by America CV Network LLC. America TeVe is committed to serve the Hispanic community by providing 9 hours of high quality news and entertainment programming. America TeVe has on-air distribution in Miami, New York and Puerto Rico. America TeVe can be seen in Miami in channel 48.1 and 41.1, Comcast 12 (Dade County) and Comcast 15 (Broward County), Atlantic 17, Direct TV 41, Dish 41, and Uverse AT&T 48. New York on-air 34.1, and Verizon Fios 479. Puerto Rico on-air 42.1, One Link41, Choice 21, Claro TV 24, Liberty 24 and Dish 7 (after 7 p.m.). Live streaming and more information regarding America Teve WJAN's original programming is available at www.americateve.com. more than 450 new jobs in the Saguenay region. 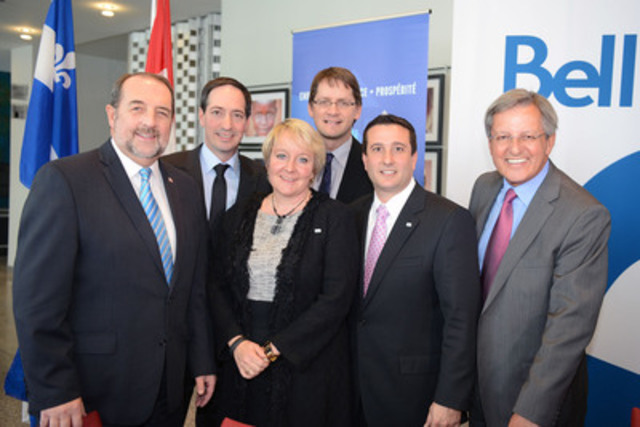 of the Economic Development Agency of Canada for the Regions of Québec. the 18,000 team members we now employ across Québec." Jonquière and to generate local economic benefits." $16 million to the local economy each year. all other levels of government." TV, the most advanced TV service available in Canada. deliver the most advanced TV, Internet and wireless services available. company with leading assets in television, radio and digital media. anniversary of Dr. Martin Luther King Jnr's 'I have a dream' speech. years of the passing of Stephen Lawrence. classics like 'Inner City Blues' (Make Me Wanna Holler). biggest and most influential trade unions." campaign effort, to achieve justice for Stephen. 'Song for Stephen' winners album. and the Stephen Lawrence Charitable Trust and is proud to back 'A Song for Stephen'. the Stephen Lawrence Charitable Trust. irrespective of race, a career in journalism with the opportunity to intern with them. SAN RAFAEL, Calif., Nov. 29, 2013 /PRNewswire/ -- This year continues to be a big one for modern classical composer and baroque virtuoso keyboardist, Anthony Newman. Earlier this year, 903 Records released Newman's Complete Collected Organ Works of JS Bach, a 9-CD set and Complete Collected Harpsichord Works of JS Bach, a 10-CD set, both available at CDBaby.com. Now, Complete Original Works of Anthony Newman is being released December 15(th) by 903 Records and will be available at Amazon.com. Newman is best known as a Baroque specialist. His specialties include: Harpsichord, pedal harpsichord, organ, and fortepiano. Newman shocked the early music world with his 1967 debut album, Anthony Newman Plays JS Bach on Columbia Records. His fast tempi, ornamentation and rhythmic alterations, all consistent with Baroque performance practice brought criticism from the "traditionalists," but it also brought back the original excitement of the music and won him many young admirers. In 1972 Time Magazine called him "The high priest of the harpsichord." This was echoed 24 years later by Wynton Marsalis who referred to him as "The high priest of Bach" after Newman collaborated with Marsalis on the award-winning CD Gabriel's Garden. "None of my own compositions really cross the border of tonality but sometimes flirt with it. I believe that new music must have some kind of memorable melody and some kind of harmonic background to be truly worthy," Newman said. "This is gorgeous music" - Billy Joel. "Very daring, very adventurous. Bravo!" - Lukas Foss. At 72, Newman's career is still blooming. He continues to perform, record and compose music. Anthony Newman's compositions range from solo works for piano, organ, harpsichord, and flute, to smaller chamber duets, trios, and quartets, to works for chamber orchestra, to choral works, operas, and works for full orchestra. Interested reviewers may also request a copy of the box-sets. WASHINGTON, Nov. 29, 2013 /PRNewswire-USNewswire/ -- Starting in December, NASA will show the public the International Space Station in new ways that will highlight all the scientific research, cutting-edge technology testing and even the wonder of living and working in space. NASA is enhancing its daily NASA Television "Space Station Live" program and beginning a new weekly web series called "Space to Ground." "Space Station Live" will continue to air weekdays at 11 a.m. EST and now will be in a 30-minute format beginning Dec 2. It will feature live views from the International Space Station, updates on the crew's daily activities, enhanced content and interviews on space station science and features on how that science benefits life on Earth. The "Space to Ground" web series will be available every Friday beginning Dec. 6. This series will be a short wrap-up of the week's activities aboard the space station that will showcase the diversity of activities taking place aboard the world's only orbiting laboratory. This video also will be posted to the agency's social media accounts and can be shared and downloaded by the public. The International Space Station remains the springboard to our next great leap in exploration. The space station is a convergence of science, technology and human innovation that is helping us learn what it means to be a spacefaring people by demonstrating new technologies and making research breakthroughs not possible on Earth. NEW YORK, Nov. 29, 2013 /PRNewswire/ -- Subscriptions to MLB.com At Bat, the 10(th) highest grossing mobile app in App Store history, are now available as holiday gifts for the first time. Instead of waiting in bricks-and-mortar store lines or giving a generic gift card, anyone can gift At Bat for the 2014 MLB season, through a direct purchase of the $19.99 full-season subscription from MLB.com. With access to the complete set of premium features in 2014, including live audio of every game and the MLB.TV Free Game of the Day, At Bat 14 will be the perfect holiday gift for any baseball fan. At Bat currently offers full coverage of the Hot Stove and the upcoming Baseball Winter Meetings in December. MLB Advanced Media's mobile developers also are working on new features to be unveiled in the 2014 edition of At Bat. Complete details will be available at launch next year. For more information, visit MLB.com or text GIFT to 31826. NEW YORK, Nov. 29, 2013 /PRNewswire/ -- The Weinstein Company (TWC) and eBay, the world's largest online marketplace and a leading platform for charitable giving, have teamed up this holiday season to offer VIP experiences and one-of-a-kind items for the 27 days following the Thanksgiving release of TWC's highly anticipated film, Mandela: Long Walk to Freedom. The packages, including meet & greets, curated experiences, original signed memorabilia and more, will be auctioned through eBay's Giving Works platform with 100 percent of the proceeds going to support the legacy work of Nelson Mandela at the Nelson Mandela Foundation - a non-profit organization dedicated to supporting its Founder's work in the promotion of social justice and democracy. Mandela: Long Walk to Freedom - starring Idris Elba and Naomie Harris - is based on Nelson Mandela's biography of the same name and chronicles the life journey of South Africa's first democratically elected president, from his childhood in a rural village through his inauguration. In recognition of the 27 years that Mandela spent imprisoned prior to his political ascendance, the donated items will be auctioned over the course of the 27 days between Thanksgiving and Christmas. "We are thrilled to partner with eBay Giving Works to support the Nelson Mandela Foundation's excellent work in preserving the memory of one of the world's most iconic and inspirational figures, surrounding the release of Mandela: Long Walk to Freedom," said Lance Still, EVP Promotions & Integrated Marketing for The Weinstein Company. The partnership kicks off on November 29(th) with the first wave of auction items, which range from an American Idol Season 13 finale experience package provided by Ryan Seacrest and an AMG driving school experience provided by Mercedes-Benz, to exclusive Kadir Nelson artwork and a style consultation package provided by Marie Claire magazine. The second wave of auctions begins on December 7(th), offering items such as a curated trip to South Africa provided by South African Airways Vacations and South African Airways, an Indianapolis 500 NASCAR experience provided by Chip Ganassi Racing, a Project Runway behind-the-scenes experience, and an original first edition signed copy of Nelson Mandela's book. On December 15(th), the final wave will introduce items including a signed Magic Johnson basketball and jersey, a Le Creuset premium cookware package, a consultation with renowned fitness and nutrition expert and best-selling author, Harley Pasternak, and more, which will bring the bidding to a close on Christmas Day. Founded in 1995 in San Jose, Calif., eBay Inc. (NASDAQ: EBAY) is a global commerce platform and payments leader connecting millions of buyers and sellers. As we help to drive the next generation of commerce, we believe in the power of our employees, technologies and global networks to also enable positive social and environmental change in the world. Integrated into eBay's regular buying and selling platform, eBay Giving Works is a program that allows fundraising for nonprofits and fundraising for charity. The eBay Giving Works program is part of a portfolio of programs, resources, and tools across eBay Inc that are intended to enable and inspire online charity donations at a scale never seen before. Learn more at givingworks.ebay.com. Since 2005, TWC and Dimension Films have released such films as GRINDHOUSE; 1408; I'M NOT THERE; THE GREAT DEBATERS; VICKY CRISTINA BARCELONA; THE READER; THE ROAD; HALLOWEEN; THE PAT TILLMAN STORY; PIRANHA 3D; INGLOURIOUS BASTERDS; A SINGLE MAN; BLUE VALENTINE; THE COMPANY MEN; MIRAL; SCRE4M; SUBMARINE; DIRTY GIRL; APOLLO 18; OUR IDIOT BROTHER; I DON'T KNOW HOW SHE DOES IT; SARAH'S KEY; SPY KIDS: ALL THE TIME IN THE WORLD IN 4D; MY WEEK WITH MARILYN; THE IRON LADY; W.E. ; CORIOLANUS; UNDEFEATED; THE ARTIST; BULLY; THE INTOUCHABLES; LAWLESS; KILLING THEM SOFTLY; THE MASTER; SILVER LININGS PLAYBOOK; DJANGO UNCHAINED; QUARTET; ESCAPE FROM PLANET EARTH; DARK SKIES; THE SAPPHIRES; SCARY MOVIE 5; and KON-TIKI. Currently in release are UNFINISHED SONG and FRUITVALE STATION, LEE DANIELS' THE BUTLER, THE GRANDMASTER and SALINGER. Upcoming releases include 12-12-12, PHILOMENA, MANDELA: LONG WALK TO FREEDOM and AUGUST: OSAGE COUNTY. The Nelson Mandela Centre of Memory at the Nelson Mandela Foundation, a registered Trust, is a human rights-oriented not-for-profit organisation. The Centre delivers to the world an integrated and dynamic information resource on the life and times of Nelson Mandela, and promotes the search for sustainable solutions to critical social problems through memory-based dialogue interventions and tangible activations to realise the legacy of Madiba. BEVERLY HILLS, Calif., Nov. 29, 2013 /PRNewswire/ -- Netflix, Inc. (NASDAQ: NFLX) and NBCUniversal Television and New Media Distribution today announced a licensing agreement allowing Netflix members in Canada to instantly watch feature films and previous seasons of some of today's most popular TV shows from NBCUniversal Television and New Media Distribution. The deal includes a number of titles that will be exclusively available across any subscription video on demand platform in Canada. "We are pleased to be the exclusive online subscription home for Downton Abbey, Suits, Bates Motel, as well as for terrific feature films in Canada," said Sean Carey, Vice President, Content Acquisition at Netflix. "We're always looking to add TV shows and movies we know our members will love, and its especially exciting to add these hugely popular titles from NBCUniversal Television and New Media Distribution with the holidays right around the corner." "We are delighted that Netflix continues to recognize the value of NBCUniversal's archive of work. Now Netflix members in Canada have access to a popular, fan-favorite and high-quality slate of films and television shows from NBCUniversal," said Ron Suter, Executive Vice President, NBCUniversal Television & New Media Distribution, Canada. "Bringing NBCUniversal's content to Netflix's Canadian marketplace is a natural progression to our long-standing relationship with Netflix," added Frances Manfredi, President, NBCUniversal Television & New Media, U.S. & Canada. Netflix is the world's leading Internet television network with over 40 million members in more than 40 countries enjoying more than one billion hours of TV shows and movies per month, including Netflix original series. For one low monthly price, Netflix members can watch as much as they want, anytime, anywhere, on nearly any Internet-connected screen. Members can play, pause and resume watching, all without commercials or commitments. NBCUniversal Television & New Media Distribution, Canada, sells current television and film product as well as content from NBCUniversal's vast library (Universal Pictures, Universal Television, Universal Cable Productions, NBC Late Night properties, etc.) to all forms of Canadian broadcast TV, basic cable, pay cable and subscription video-on-demand (SVOD) markets. Current programming includes "Chicago Fire," "Parenthood," "Grimm," "Sean Saves the World," "Defiance," Royal Pains," "Late Night with Jimmy Fallon" and the upcoming series' "Chicago PD," "About a Boy" and "The Sound of Music Live!" special. public artwork and invite the whole world to help via http://www.peopleoftomorrow.com. The public art installation by Arne Quinze symbolises connection between people. bridge, thanks to a specially developed website: http://www.peopleoftomorrow.com. personalities from throughout the world have already agreed to take part. be officially opened in June 2014. 'One World by the People of Tomorrow' is a work by everyone and for everyone. enhance safety without causing light pollution. shift to a subdued intensity - perfect for a heart-warming evening stroll. steel and the tropical hardwood Okan from the FSC label. workshops and a large festival event in Khartoum at the National Museum. completed a 12-date UK tour, 'Turning Tides'. sharing of good practice across the diaspora. Don't miss the RAW LIVE show 5 DECEMBER at BRIXTON JAMM 7.30pm-1pm. artists KNYTRO and BERNARD MARGARIT, with DJ SNUFF, WU-LU, MONSTER PLAYGROUND. programmes for young people and adults in London, the UK and internationally. in artist development and sustainable futures in the arts. young offenders, children's projects, live music events and performances. professional, user friendly, safe, inspiring and productive learning environment. streaming application on PlayStation(R)4 - Sony's next generation video games console. Dolby(R) Digital Plus (5.1) surround sound. streaming app to the next generation of this great console." number of installations so far. brings to the entire cinematic experience." experience instead of watching their television sets at home." easier and definitely added to the intensity of the scenes." cult hit featuring Shakespearian plot twists and a film noir screenplay. right person to handle the camera for Vidiyum Munn. Barco to support their ambitious project," Garamhegyi added. TV, media libraries and packaged media). about 3,900 employees worldwide. Barco posted sales of 1.156 billion euros in 2012. CARLSBAD, Calif, Nov. 28, 2013 /PRNewswire/ --Razer(TM), the world leader in high-performance gaming hardware, software and systems, today announced the launch of its new top-of-the-line headphones: the Razer Kraken Forged Edition. Crafted withear cups that are machined out of aircraft-grade aluminum and finished with a matte texture, the Razer Kraken Forged Edition is carefully hand-assembled, ensuring the build quality matches the premium looks and guts. Razer's renowned audio engineers spent countless hours fine-tuning the Kraken Forged Edition's 40 mm bass-heavy drivers to perfection. As a result, the neodymium pair work in unison with the headphone's acoustic chambers and isolated closed ear cup design to deliver booming bass, clear mids and crisp highs for sound that's optimized for music and pitch-perfect for gaming. "These are the best headphones on the market for both music and gaming, period," says Min-Liang Tan, Razer co-founder, CEO and creative director. "We've made some incredible audio products in our time, and I'm proud to say that we have taken another huge step forward in terms of audio quality in a pair of headphones with phenomenal fit and finish." For more information about the Razer Kraken Forged Edition, check out www.razerzone.com/Kraken-Forged. For more information about the Razer Kraken Forged Edition, please visit www.razerzone.com/Kraken-Forged. NEW YORK, Nov. 28, 2013 /PRNewswire/ -- Royal Caribbean International - the first cruise line to feature fully licensed, Tony Award-winning Broadway productions - today announced that guests onboard Quantum of the Seas will enjoy MAMMA MIA! - the smash hit musical based on the songs of Swedish pop sensation ABBA - when she sails from the New York area in November 2014. The first details of the new ship's entertainment offerings were revealed to viewers who tuned in to watch the cruise line's float, "A World at Sea," set sail down the streets of Manhattan as part of the 87(th) Annual Macy's Thanksgiving Day Parade. "The debut of MAMMA MIA! onboard Quantum of the Seas continues to raise the bar of what we offer our guests onboard our latest groundbreaking ship," said Lisa Lutoff-Perlo, Executive Vice President, Operations, Royal Caribbean International. "Since introducing Hairspray onboard Oasis of the Seas in 2009, our Tony award-winning musical productions have been incredibly well-received by guests, and we are proud to expand our Broadway at sea offerings with our fourth licensed main-stage production - more than any other cruise line." More than 54 million people around the world have fallen in love with the characters, the story and the music that make MAMMA MIA! the ultimate feel-good show. The sunny, funny tale unfolds on a Greek Island paradise where on the eve of her wedding, a daughter's quest to discover the identity of her father brings three men from her mother's past back to the island they last visited 20 years ago. ABBA's greatest hits - including "Dancing Queen," "The Winner Takes It All," "Money, Money, Money" and "Take a Chance on Me" - propel this enchanting tale of love, laughter and friendship. For 45 years, Royal Caribbean has brought the best and most innovative ships to the Caribbean, as well as destinations around the world, and the cruise line continues that commitment with Quantum of the Seas. For more information on Royal Caribbean's global fleet and private destinations in the Caribbean - including Labadee, Haiti and CocoCay, The Bahamas - visit RoyalCaribbean.com. Media can stay up-to-date by following @RoyalCaribPR on Twitter, and visiting RoyalCaribbeanInternationalPR.tumblr.com and RoyalCaribbeanPressCenter.com. Travel professionals should go to CruisingPower.com; or call (800) 327-2056; and follow Facebook.com/VickiLovesTravelAgents. For additional information or to make reservations, vacationers should call their travel agent; visit RoyalCaribbean.com; or call (800) ROYAL-CARIBBEAN. Follow us on Facebook at Facebook.com/RoyalCaribbean or on Twitter @RoyalCaribbean. ARLINGTON, Texas, Nov. 28, 2013 /PRNewswire/ -- Multi-platinum recording artist Selena Gomez will take the stage today for a LIVE performance to kickoff The Salvation Army's 123rd National Red Kettle Campaign at AT&T Stadium during halftime of the Dallas Cowboys vs. Oakland Raiders nationally televised game on CBS. For the past 17 years, the Dallas Cowboys have helped The Salvation Army launch the campaign during its nationally televised halftime performances. The Red Kettle Campaign raised more than $148.7 million last year to serve America's most vulnerable by providing food, shelter and more than 1 million toys for children during the holidays. "It is such an honor to perform in my hometown today and build awareness for the Red Kettle Campaign," said Gomez. "By dropping change in the kettles, you are changing a child's life. The Salvation Army uses those nickels, dimes and quarters to provide after school programs, summer camps and toys for children during the holidays, and all in the community where they were donated." The LIVE performance will mobilize a new generation of Salvation Army supporters and build awareness of the organization and Red Kettle Campaign with a younger and influential audience. Selena will be performing three songs from her new album "Stars Dance." Since the partnership began in 1997, the Dallas Cowboys organization has helped raise more than $1.75 billion for The Salvation Army. Past performers include Kenny Chesney, Enrique Iglesias, Keith Urban, Daughtry, Jonas Brothers, Kelly Clarkson, Carrie Underwood, Sheryl Crow, Destiny's Child, Toby Keith, LeAnn Rimes, Creed, Jessica Simpson, Billy Gilman, Clint Black, Randy Travis and Reba McEntire. "Selena is a triple threat and we cannot wait to share her incredible performance with the nation. To have her help us bring greater visibility to the Red Kettle Kickoff and The Salvation Army is a great gift this holiday," said Charlotte Jones Anderson, executive vice president and chief brand officer for the Dallas Cowboys. Anderson also serves as Chairman of The Salvation Army's National Advisory Board alongside fellow board members, Gene and Jerry Jones. "The Salvation Army is an organization close to my heart, and this time of year allows us to really put a spotlight on all of the ways it serves more than 30 million of America's most vulnerable throughout the year." The Red Kettle Kickoff is just the beginning of an exciting Christmas season for The Salvation Army. In addition to the more than 25,000 Red Kettles being stationed in storefronts and street corners nationwide, there will be other ways for the public to get involved. bell ringers, Salvation Army and celebrity spokespeople. country will be collecting toys for children this holiday. www.salvationarmyusa.org to find a local corps. From its humble beginnings as a program started by a Salvation Army captain in San Francisco in 1891, the Red Kettle Campaign has grown into one of the most recognizable and important charitable campaigns in the United States. It provides toys for kids, coats for the homeless, food for the hungry and countless social service programs year-round. As part of the campaign, more than 25,000 Salvation Army volunteers throughout the country ring bells and solicit donations to the red kettles. Selena Gomez has become one of the most accomplished actors and recording artists today and all by the age of twenty-one. 2013 has been a big year for Selena. In July, she released her fourth album "Stars Dance" which debuted at number one on the Billboard charts. The lead single "Come and Get It" became her first number one single and won an MTV Video Music Award for "Best Pop Video." On the heels of the release of her album, Gomez launched her very successful "Stars Dance World Tour" which is currently scheduled to conclude later this month. She has sold over 10 million singles in the US and has become a fixture on the dance scene garnering six singles that have landed at number one position on the Billboard Dance Club/Play charts. In the area of community service, Gene and Jerry Jones Family Charities' mission is built on a philosophy of helping those who don't have the strength, the resources or the means to help themselves. As a sports entity that has enjoyed unprecedented success and recognition for more than four decades, the Dallas Cowboys feel a strong obligation to transfer that championship tradition and the magic that it creates to the bigger purpose of making a difference in the community. More information about the Dallas Cowboys is available at www.dallascowboys.com. For additional information about The Salvation Army and Red Kettle Kick-Off, please visit http://blog.salvationarmyusa.org, www.facebook.com/SalvationArmyUSA or https://twitter.com/salvationarmyus. Q1. Why is this new law so close to your heart? Q2. How did you get MPP for Oxford, Ernie Hardeman involved? Q3. What are the signs and symptoms of CO poisoning? Q4. How do you feel now that your mission is complete? Q6. How can people protect themselves for CO poisoning? Q1. What happened today and how long have you been waiting? Q2. Why was it so important to you to get this bill passed? install a CO detector into their homes? Q4. When do I have to install a CO detector? is available for download by accredited journalists. Please contact video@newswire.ca for access. For assistance with Video On-Demand, please contact CNW at video@newswire.ca or (416) 863-5612.
from our website to accredited journalists worldwide. HOLLYWOOD, Calif., Nov. 27, 2013 /PRNewswire/ -- Punch TV has announced Jackie Christie, Star of "Basketball Wives L.A." on VH1, as Host of this year's Annual New Year's Eve Extravaganza. Celebrity guests, viewers and supporters of Punch TV will ring in the New Year at Punch TV Studios in Hollywood. Jackie Christie--sought after Fashion Designer, Model, Producer, Public Speaker and Bestselling Author of several popular books, including: No ordinary Love, A true story of marriage and basketball! and Sexual Relations: A His & Hers Guide To Finding Greater Intimacy--is also the star of "Basketball Wives L.A." and wife of former NBA superstar Doug Christie. Punch TV's star-studded event will include live performances by some of today's hottest artists and will be held at Punch TV Studios located at 5907 West Pico Blvd, Los Angeles. The event is set to serve as Punch TV's first ever live broadcast, which will provide viewers across the nation the opportunity to join the party from the comfort of their own homes and watch the countdown with Jackie Christie and friends. "It is a great honor to not only have Jackie to host this history-making event, but to also know Jackie believes in the vision of Punch TV and supports our monumental media movement," states Joseph Collins, Punch TV CEO. Punch TV is considering becoming a publicly traded company and raising $100 million during its IPO, and Collins is expected to make a speech that evening. IRVINE, Calif., Nov. 27, 2013 /PRNewswire/ -- VIZIO, Inc., America's #1 Smart TV(1) and large size LCD company(2), announced today Q3 2013 results, showing continued industry strength with 18% year-over-year shipment unit growth during a period where the North American LCD TV market declined 4%(3). Only one other brand showed year-over-year growth during the same three quarters of 2013 according to NPD DisplaySearch report(3). Much of VIZIO's recent success can be attributed to its growth in both large size and smart TVs. The number one choice by many Americans at retailers nationwide, VIZIO recently launched its M-Series all-Smart TV collection which is now available at Best Buy, Costco, Sam's Club, Walmart, VIZIO.com. Featuring an ultra-modern, ultra-thin bezel that virtually vanishes next to the nearly edge-to-edge display, VIZIO's enhanced HDTV line-up, spanning 32" to 80" class sizes, features VIZIO's VIA Plus smart TV platform that demonstrates the brand's leadership in HDTV technology and design-focused enhancements. "VIZIO's focus has always been to make the best technology accessible to all consumers and over the past nine months, we've looked to build on this by expanding our market share in the large-size and smart TV categories," said Matt McRae, VIZIO Chief Technology Officer. "In addition to VIZIO's #1 rank in both large size LCD and smart TVs, we are now also America's #1 sound bar company(4. ), further validating our innovative approach and demonstrating that VIZIO products continue to resonate with a growing number of U.S. consumers." In order to continue its market share growth, VIZIO's product quality and customer satisfaction has been a focus since VIZIO shipped its first TVs ten years ago. VIZIO, ranked(5) "Highest in Customer Satisfaction with HDTVs Less Than 50 Inches (Tied)," is backed by an award-recognized U.S.-based customer support team that recently took home seven Stevie® Awards for exceeding customer service expectations in the consumer electronics industry. In anticipation of the traditional high volume sales and tech support inquiries during the busy holiday season, VIZIO.com's Support Page was recently updated with tech support videos that are mobile web enabled. Now current and potential customers may also view these videos on smart phones and tablets. For more information and a list of retailers for VIZIO HDTVs and other products, please visit VIZIO.com. (1 )The( )NPD Group / Retail Tracking Service, Q2 2013 LED TV units with Apps included. (2) The NPD Group / Weekly Tracking Service, Large Size includes 60"+, Q2 2013 units sold. (3) NPD DisplaySearch North America LCD TV Shipments, Q1-Q3 '12 compared to Q1-Q3 '13. (4 )Quixel Research's Q3 2013 Sound Bar Market Report, April 2013 through June 2013. (5) J.D. Power 2013 High Definition Television (HDTV) Satisfaction Report(SM). Report based on responses from 6,007 consumers measuring 8 brands and measures opinions of consumers who purchased an HDTV less than 50 inches in the last 12 months. Proprietary study results are based on experiences and perceptions of consumers surveyed May-June 2013. Your experiences may vary. Visit www.jdpower.com. VIZIO, Inc. is headquartered in Irvine, California. In Q2 2007, VIZIO skyrocketed to the top by becoming the #1 shipping brand of flat panel HDTVs in North America and in Q3 2007 became the first American brand in over a decade to lead in North American LCD HDTV shipments. VIZIO was #1 in North America LCD for 2010(1). VIZIO is now also America's #1 Smart TV(5) and large size LCD company(2) as the leading seller of 60" and larger HDTVs in the U.S. with 30% of the market in this class(3). VIZIO was the #1 Sound Bar Company in the U.S. for Q1 2013(4). For over a decade, VIZIO has remained committed to what it does best--focus on the consumer to deliver visionary products at a great value. VIZIO offers a broad range of award winning consumer electronics that now include PCs and mobility products. VIZIO's products are found at Amazon, Best Buy, BJ's Wholesale, Costco Wholesale, Sam's Club, Target, Walmart and other retailers nationwide. VIZIO has won numerous awards including a #1 ranking in the Inc. 500 for Top Companies in Computers and Electronics and made the lists of Ad Age's Hottest Brands, CNET's Editor's Choice, CNET Best of CES 2011 - Television, CNET Best of CES 2013 - Home Theater and Audio, Home Theater Magazine's Top Picks, Good Housekeeping's Best Big-Screens, PC World's Best Buy and Popular Mechanics Editor's Choice among many other prestigious honors including "Highest in Customer Satisfaction with HDTVs Less Than 50 Inches in a Tie" from J.D. Power. For more information, please call 888-VIZIOCE or visit www.VIZIO.com.